In the world of inflatable stand up paddle boards, there are a lot of names trying to get their inflatable on the water. One great option according to many is the Ten Toes. It is an inflatable that can handle a variety of situations and one that allows the paddle boarder to enjoy a variety of water adventures. This makes it a great option for many people. Perhaps it will be one that you will love as well. The Weekender is very stable as long as you stick to the maximum weight limit of 250 pounds. For this reason, it is recommended for all paddle boarding skill levels. It is durable and made using military grade PVC. This means it is virtually indestructible, regardless of what you may bump into or slide across while in the water or along the bank. The overall size of it when inflated is 10ft x 30in. It is 6 inches thick, which increases its stability and firmness. However, even with the size of it inflated, it is still very portable since it rolls up into an 11in x 36in package. With one purchase, you get the iSUP, three fins, a pump, a repair kit, and a three-piece lightweight, adjustable aluminum paddle. This means that it includes everything you could possibly need to get started on an adventure that you will not forget. The entire bundle weighs approximately 39 pounds. It is covered by a 1-year warranty to ensure you are 100% satisfied with your purchase. It is also one of the few iSUPs that are available in multiple colors. You can choose from blue, green, white, red, and seafoam. Most owners say that the WEEKENDER is a great board that is very reliable in a variety of situations. There are people who use it in gentle rivers, gentle beach waves, in the surf, and more. A few have even ventured out into white waters and experienced success with it. Most people feel comfortable on it and that it tracks straight. 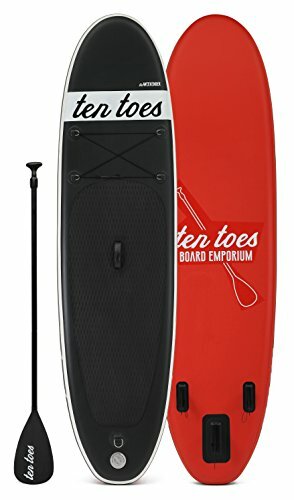 This paddle board is well worth the money for most, especially since it comes with everything you could need to take it along on a camping trip or other adventure. They say that it remains stable, even if there are dogs or people on board with you and they move around while you are paddling. There is no worry about paws puncturing or it having other issues. The board does not sit as high in the water as some people want for it to. The number one complaint among most people is that it is very difficult to inflate it to the recommended PSI. This is because the gauge does not read PSI until it is nearly full and the last little bit of air is sometimes hard to pump in to it. Some people also complain because it is a single chamber and they worry about the potential for punctures. It is a concern with all iSUPs, but most are made durable enough that it does take a lot to put a hole into them. That is why most other people feel comfortable. Ten Toes has a consistent following of people who love it. The ones who feel it is not a worthy iSUP apparently are not that into inflatable paddle boards. Their issues with it are unfounded in most cases. It is just the way that an inflatable paddle board is going to be. Even the difficult inflation of it is something that most all inflatables must overcome and comparing the inflatable board to other inflatable boating equipment is comparing apples to oranges. They are all different things with different uses and requirements.